I will forever sing the praises of Wil Farr, and not just because we have the same birthday. Dude’s been making some of my favorite tunes for the past decade or so, and since teaming up with his latest band, Hurrah! A Bolt of Light!, things have been really jiving. Hurrah!’s fan-funded, self-titled second album feels like a natural evolution from the band’s debut. Hurrah’s 2011 album, Hello!, was a balanced blend of alt-country sincerity and unbridled rock energy. My favorite song from the band’s full-length debut, “One Drink,” took a simple melody and ran like hell with it. It is still one of my go-to rage therapy aids. On the new release, Hurrah! reins in that fury a bit, resulting in something that sounds a bit more mature and refined. Compared to early demo recordings of several songs on this album, the band clearly made an effort to sand things down on this outing. “Hands in the Bees’ Nest” particularly reached fruition with a deeper elegance than its original manifestation, trading Farr’s bristling growls for anguished cries. The album opens strong with “I Sold My Soul,” a relatively upbeat tune showered with handclaps and a catchy chorus of “oh whoa oh”s. It’s easily the most fun, accessible song the band’s put out, and even carries what sounds to be a sweet plea of everlasting (even if a bit futile) love. It’s an appropriate reintroduction to the many talents within the group, Jacob Pleakis returning to pound out keys, Kenny Shaw kickin’ it on the drums, a low bassline from Doug Drewes, and driving guitar licks from Dave Freedman accompanying the stylings of bandleader Farr. Sargent House continues to make me feel as if there’s hope out there. I had the joy of seeing one of my favorite drummers, Chris Common, play with the band Marriages for this tour. 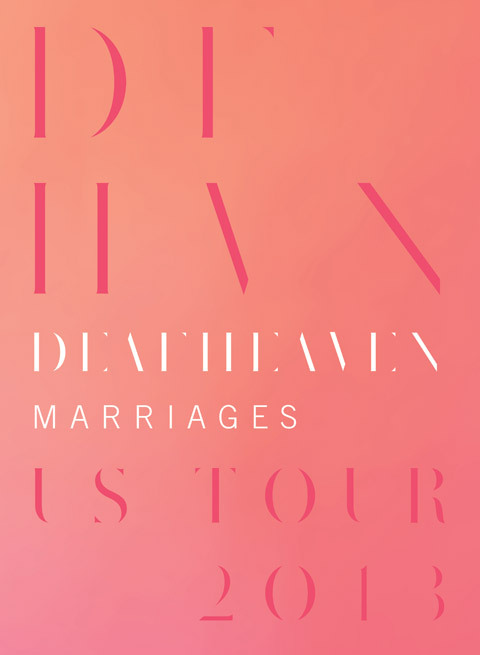 Then you add the amazing talent of Kerry and George from Deafheaven, who headlined the tour, and a beautiful, symbiotic relationship in the most simplest terms is translated onstage. The lineup took me in places where music should: Outside of your comfort level. How these two got paired together is an enigma of the greatest sorts; truly genuine music from extremely talented people. I’ll open with Marriages. The two main band members, Emma and Greg, who gained popularity in Red Sparowes, continued on and have recorded their debut album, Kitsune. Greg and Emma are two people who just, simply put, play extremely well together. Emma’s hauntingly beautiful voice and even equally beautiful guitar playing have such an emotional quality, you feel every note. Greg’s synth tracks add little flourishes to his solid bass playing that propels every song. This is my second time seeing them live and the first time Dave Turncratz from Russian Circles supported them on drums. As I mentioned, Chris Common went out with them on this tour and held everything together perfectly. Now for the headliners, who went on tour supporting their second release, Sunbather, out on Deathwish. Deafheaven has evolved in ways everyone thought unimaginable. A new era to the classic thoughts on black metal, Deafheaven draws inspiration from U2 and Morrissey among many other bands not in the genre. That is what sets them apart. They weave a complex web of soft and fast passages. The journey taken is fought and won with every song. The song “The Pecan Tree” is most likely their finest song, opening with pure energy and moving you in so many directions. The title track proves how this band has progressed musically and emotionally as a band. Gaytheist‘s second full-length album with Good To Die Records, Hold Me…But Not So Tight, was just released this spring and, in short time, delivered to me on beautiful 160 gram white/pink haze vinyl. I was turned onto Gaytheist with their 2012 album Stealth Beats. Their frantic punk riffs — compliments of Tim Hoff, Nick Parks — Jason Rivera’s vocals, and lyrics entangled me into the days of my youth as an avid punk kid. I frantically rushed inside and put the record on my turntable. I had been holding out, not listening to any songs on the Internet, not spoiling the moment. I contemplated my beverage choice in my kitchen as the first track, “Starring In ‘The Idiot’,” started and ended faster than I could grab a drink. Now that’s punk rock. Rolling right into the next few tracks, I sat down with my beer, closed my eyes, and rythmically bopped my head around. “60 Easy Payments” downshifted the gears and instead of fast-paced trash, they get heavy, but with a lyrical humor that you makes ya chuckle a bit, ’cause most adults have been there. 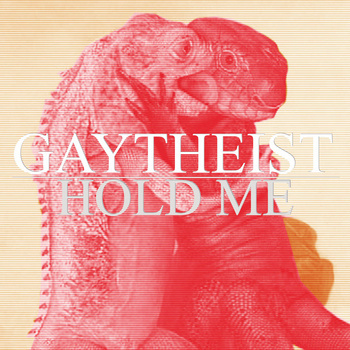 This is Gaytheist, a perfect blend of punk and what have you. Getting into the album a bit more, there’s pop, punk and some delicious licks that make you feel accepted into whatever party is happening. You are the “it” crowd.